Japan’s ubiquitous volcanoes frequently cause land and sea to shudder. But they are also the source of the healing waters of the Onsen in Japan. These are the public bath houses all over Japan that are often supplied with mineral water drawn from hot springs in volcanic craters. Onsen have been part of Japanese life for millennia. One of the great delights of visiting Japan is staying in ryokans – traditional inns – with Onsen. Although most ryokans have public bathing areas, not all are built around hot springs. 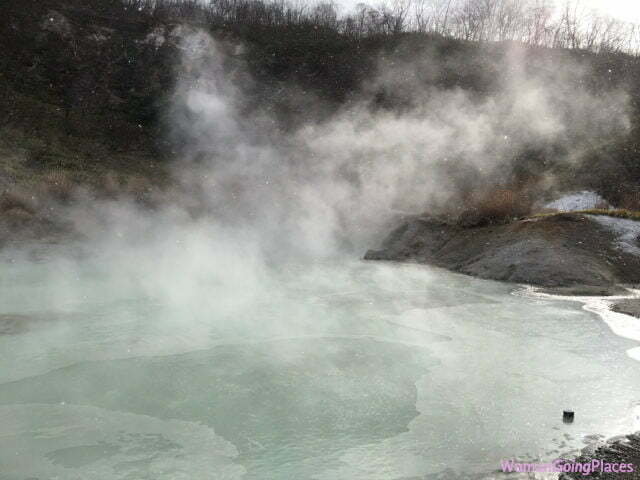 The most memorable hot spring Onsen we visited was in Noboribetsu on the northern island of Hokkaido. It is an area called Hell Valley because it brings to mind a picture of the underworld. Rumbling, sulphurous clouds of smoke and vapour spew from numerous volcanic craters and caves. Pools of bubbling mud, geysers and streams of burning hot water cover the landscape. We stayed in the ryokan, Dai-Ichi Takimotokan, on the site of the original Onsen set up here 150 years ago. The thermal waters here are said to have special healing properties. For this reason it is an area popular with not only Japanese, but also with South Korean and Chinese visitors. There are many ryokan and Onsen in the area. After a walk in the surrounding National Park through the unearthly landscape, it is a treat to then step into an Onsen and sink into the mineral rich sulphur baths for as long as you can stand the temperature of 38-40 degrees celsius. You can also relax in the steaming outdoor bath, surrounded in autumn by snow-covered trees. Even in a smaller and simpler ryokan in Hakone, south-west of Tokyo on Honshu, the Onsen was the highlight of our stay at the Yajikitano Yu Ryokan. If your hotel or ryokan does not have an Onsen, there may be Onsen available at a general public facility, for example, in Matsuyama on Shikoku, the famous Dogo Onsen, thought to be the first Onsen in Japan. Or you can go to a neighbouring hotel wherever you are staying and use the Onsen there for a fee. Onsen vary from luxurious to basic, but they are well worth the experience. There is a particular procedure that governs correct behaviour in the Onsen. Some Onsen are mixed, but we were only in those in which men and women are divided into separate areas. You take off all your clothes and place them in a basket or locker, and enter a large room with rows of stools, individual shower hoses, mirrors, soaps and shampoos. You are given a small white towel/washcloth with which you scrub yourself and rinse off until you are thoroughly clean. Then you walk naked into the adjoining area where there are pools of different sizes and temperatures. These pools are strictly for relaxation, not for washing. In the beginning you may feel awkward without clothes or a swimsuit, but you quickly get over it. You take with you the small towel which you used to wash yourself. It is considered unhygienic and therefore offensive to allow this washcloth to touch the water of the relaxation pools. So some fold it and balance it on their heads, while others tie it stylishly into a kerchief around their heads. Many Onsen have saunas and also provide hair dryers, skin lotions and other beauty products. If the Onsen has an outside pool, try it, possibly after you have sampled the inside pools. They are usually set in a secluded area made to appear as natural as possible with rocks and greenery. Even though rooms in most ryokans have an ensuite toilet and shower, bathing in the Onsen is quite a different and more blissful experience. It is certainly an essential experience of Japan.